We're all guilty of the don'ts in fashion, unless of course, you have a personal dresser. 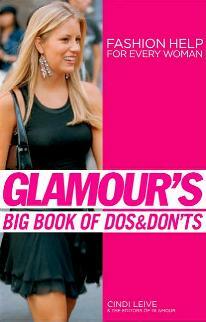 This helpful book covers Your Body Basics, Your Weekend Life, Your Work Life, Your Nights Out, and Your Special Events. Each section has a Rules section as well as Closet Essentials, What to Wear When, Tricky Areas, Makeovers, and a Hall of Shame. It seems as though they've covered everything to help us avoid looking like Christmas trees. There's even a Do and Don't page from top designers like Diane von Furstenberg and Valentino. The Hall of Shame pages are funny (see yourself anywhere?) and worth checking out. There are many celebrity photos, and even they manage to not look their best sometimes. You'll find out how to wear boots, how to wear your hair, and how to look your best, which is what most women aspire to. Well, not most, but a good number of women. I liked that they give us the reasons for both the dos and don'ts - most of which makes perfect sense. I also liked the makeovers - useful and practical advice for "normal" figures. And frankly, many of us need all the help we can get, and this book offers great fashion tips. You won't believe the Don'ts - quite astonishing. Check out these "Just Don't" (strip of pics down the right side of the page) for a good laugh - page 87 (first picture); page 101 (second picture); page 161 (second picture), and page 167 (first picture - get real!). I have to wonder who the heck even makes clothes like these. Conclusion - Great fun and great advice on how to dress ourselves. It's worth taking note - you don't want to end up on these pages as a "don't".